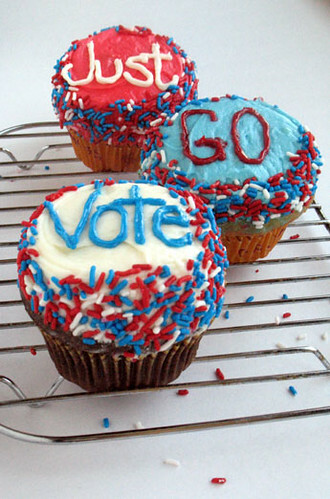 We'll have an election/political cupcake roundup soon (if your bakery or somewhere near you is doing something special, email us at cupcakestakethecake at yahoo.com with photos, and we'll try to include it), but for now, a message from The City Cook (with cupcakes by Crumbs. You know, we just had another federal election here in Canada on October 14th - the 3rd in four years. Yet again, we elected a minority government for the third time and had the lowest voter turnout ever. I am sure we'll be going to *another* election in a year or two to try to break the minority government trend (or not). When it does happen, I will bake similar cupcakes (only in red and white!) for my coworkers, friends, and (heck!) random strangers to encourage them to vote. People need to take advantage of a privilege not granted to so many in other parts of the world.